It really doesn’t get more refreshing than a chilled glass of sweet lemon Iced tea. This fresh homemade version is so easy to make truly delicious. 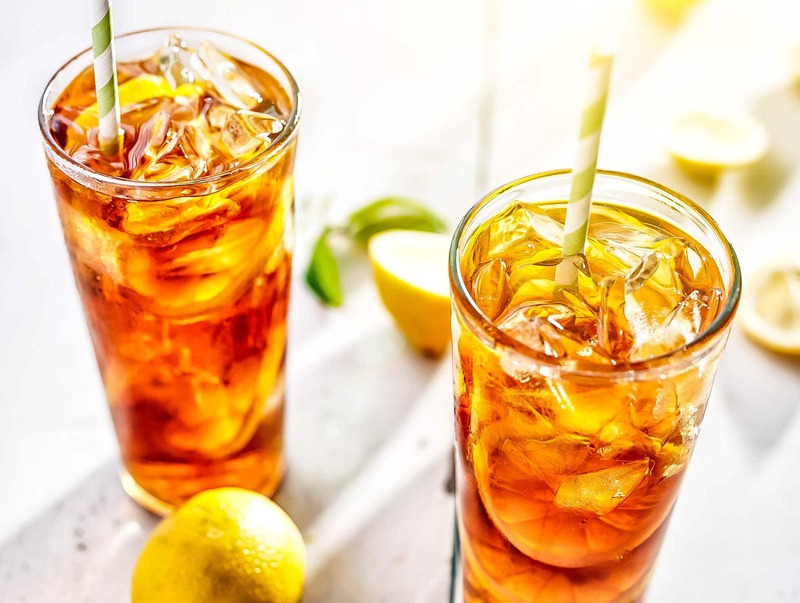 This quick and easy recipe for Sweet Lemon Iced Tea will be a summer favorite – It’s so refreshing and full of fruity flavor! It’s that time of year again – Time to enjoy warm, sunny days outside. There’s nothing better than a relaxing day at a sunlit beach or laying by the pool taking sips of a tall glass of Sweet Lemon Iced Tea. The hot brew of the tea helps to give a robust quality. The fresh lemon juice gives a fresh vibrant flavor you just can’t get with store-bought. I adore iced tea. Back home in New Jersey, I drank it all year round. They don’t sell mixes here in England and although I find the occasional bottle of ready-made in the grocery stores, it’s really hard to come by. After so many summers of craving iced tea, I decided to try my hand at making my own and ever since, I make it all the time. You can never have too many iced tea recipes right? 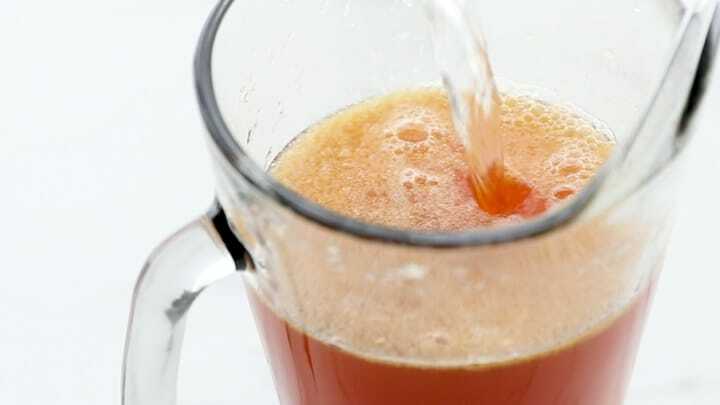 If you love iced tea, you can also check out my recipe for Sweet Peach Iced Tea – It’s delicious! 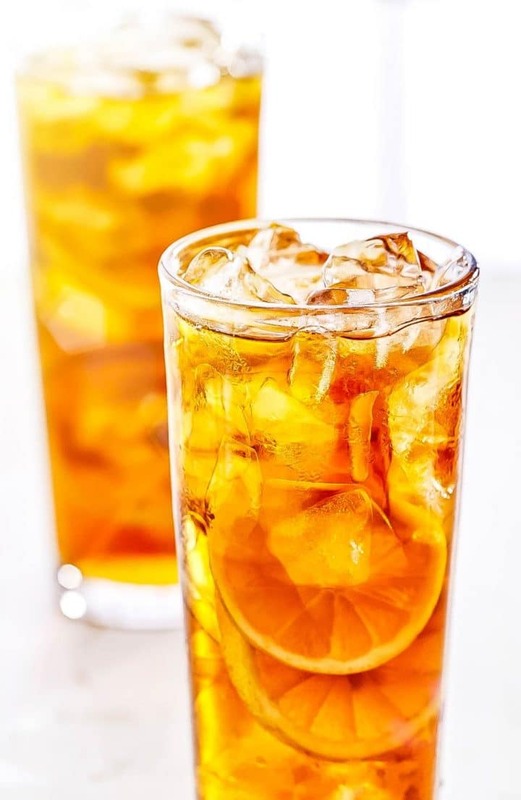 This Fresh homemade iced tea recipe is so easy to make, the only tedious part is getting all the juice out of those lemons but, please use fresh juice – it is so worth it in the end! Boil 4 cups of water then add to a large heat-proof pitcher. To the hot water add the baking soda and sugar. Mix well until the sugar dissolves. To the hot water add the tea bags and let steep for 10 minutes. The longer you steep the stronger the taste. Remove all of the tea bags. Add the lemon juice. Top off the rest of the pitcher with cold water. Place in the refrigerator until chilled. When ready to serve, add lemon slices and ice to the glasses then pour the tea. 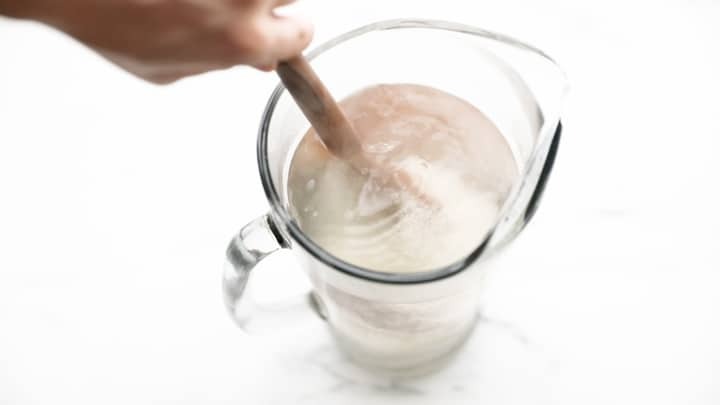 To avoid potential dangers, if you’re not sure if your pitcher is heatproof, prepare the tea in a saucepan and transfer once cooled. 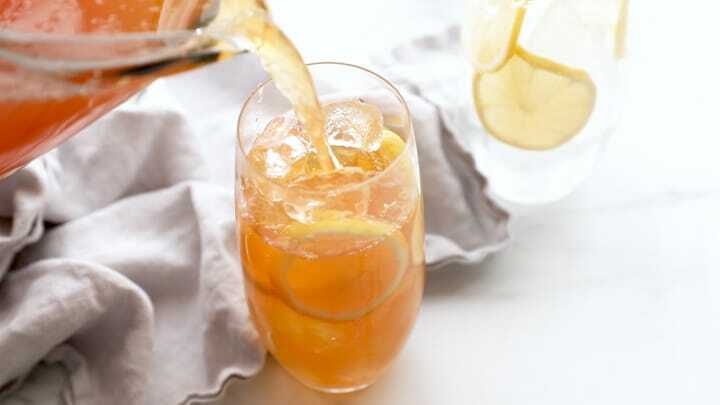 Make it to your taste: Iced tea recipes are easily adaptable. You can brew it strong or light or make it unsweetened or sweetened. Once get the basics, you can make it according to your taste. Don’t skip on steep time: Iced tea gets diluted so you really want to extract the maximum amount of flavor from your tea. Steeping long enough to get the most flavor is vital to a quality brew. Control the sweetness according to taste: Try adding the sugar in stages and taste as you go to adapt the recipe to your taste. To keep the tea from being watered down, add the ice to your glass instead of the pitcher. To keep the fruit from breaking down, add the sliced lemons to the glasses instead of the pitcher. 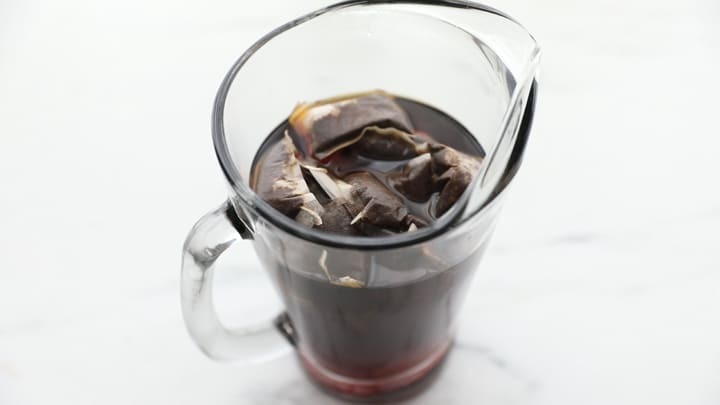 Tea blends – This recipe calls for plain black tea bags, but you can use whatever blend you like. For instance, fruit-infused black teas tend to make great iced tea. Using Green Tea – If you are using green tea, the hot brew method is particularly important as it can get bitter if you steep it cold. I have made this recipe using other citrus fruits like orange, tangerines, and limes. All of the flavors have been delicious so don’t be afraid to play around and create your own! 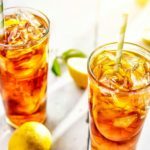 Why is Baking Soda used in iced tea recipes? Baking soda neutralizes the bitterness of the tea and gives it a much smoother taste. Watch the video showing how to make this recipe at the top of the post on PC and on mobile, under the recipe card. 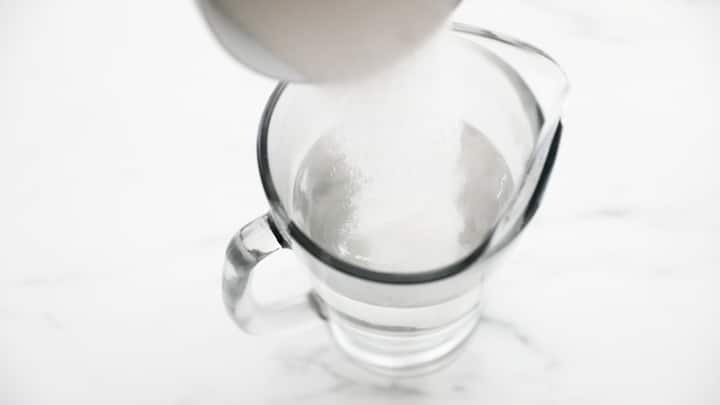 In a large, heat-proof pitcher/jug, combine the boiling water, baking soda & sugar mix well to dissolve the sugar. Add the tea bags and let steep for 10 minutes (the longer you steep the stronger the taste). Add the lemon juice and fill the rest of the pitcher/jug with cold water. Add lemon slices and ice to a the glasses and pour the tea over the ice and lemon slices to serve. Update Notes: This post was originally published in August of 2014, but was republished with new photos, step by step instructions and tips in June of 2018. Hopefully, this will sort this out for you Kari! My daughter and I are obsessed with this ice tea! Fabulous recipe. Thank you! That’s so awesome to hear! 😊 I love when people are obsessed with a recipe of mine! But how much is that? Would it be pissible for you to give some more specific measurements, please? Hi, Julie, With so many tea bags you honestly can fill the pitcher without diluting too much, but you can taste as you go. I’ll look over the recipe (It’s an older post) and see if it can be clearer. Thanks for the feedback! 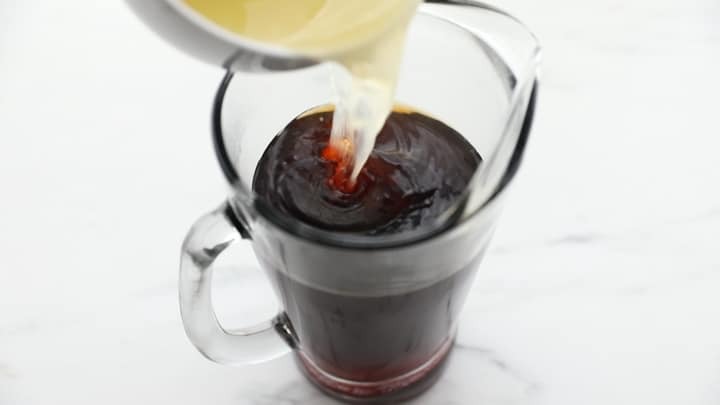 I’ve tried making iced tea so many times, and this is the only recipe I’ve found that I liked. Delicious, I can’t make enough of it. How great to hear! Thanks for the great feedback! Sorry for the confusion! I used my peach tea as a template and missed one of the changes. It’s fixed now. It makes a gallon sized pitcher. Just make sure you taste as you add the water so it’s the strength you prefer.